This example shows how to classify the gender of a speaker using deep learning. In particular, the example uses a Bidirectional Long Short-Term Memory (BiLSTM) network and Gammatone Cepstral Coefficients (gtcc), pitch, harmonic ratio, and several spectral shape descriptors. Gender classification based on speech signals is an essential component of many audio systems, such as automatic speech recognition, speaker recognition, and content-based multimedia indexing. This example uses long short-term memory (LSTM) networks, a type of recurrent neural network (RNN) well-suited to study sequence and time-series data. An LSTM network can learn long-term dependencies between time steps of a sequence. An LSTM layer (lstmLayer) can look at the time sequence in the forward direction, while a bidirectional LSTM layer (bilstmLayer) can look at the time sequence in both forward and backward directions. This example uses a bidirectional LSTM layer. This example trains the LSTM network with sequences of Gammatone Cepstrum Coefficients (gtcc), pitch estimates, harmonic ratio, and several spectral shape descriptors. 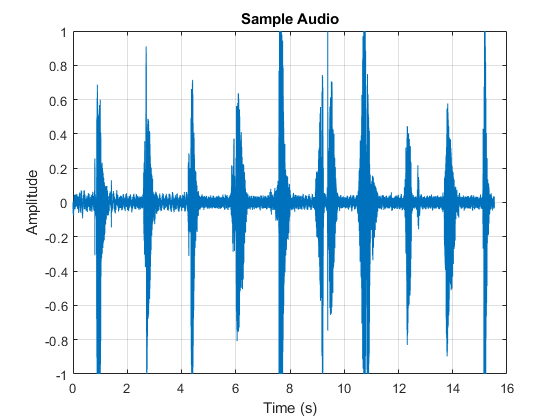 Create an audioDatastore that points to the audio speech files used to train the LSTM network. Remove silence and non-speech segments from the speech files using a simple thresholding technique. Extract feature sequences consisting of GTCC coefficients, pitch, harmonic ratio, and several spectral shape descriptors from the speech signals. Train the LSTM network using the feature sequences. Measure and visualize the accuracy of the classifier on the training data. Create an audioDatastore of speech files used to test the trained network. Remove non-speech segments from these files, generate feature sequences, pass them through the network, and test its accuracy by comparing the predicted and actual gender of the speakers. To accelerate the training process, run this example on a machine with a GPU. If your machine has a GPU and Parallel Computing Toolbox™, then MATLAB® automatically uses the GPU for training; otherwise, it uses the CPU. This example uses the Mozilla Common Voice dataset . The dataset contains 48 kHz recordings of subjects speaking short sentences. Download the dataset and untar the downloaded file. Set datafolder to the location of the data. Use audioDatastore to create a datastore for the files in the cv-valid-train folder. Use readtable to read the metadata associated with the audio files. The metadata is contained in the cv_valid-train.csv file. Inspect the first few rows of the metadata. You will use data corresponding to adult speakers only. Read the gender and age variables from the metadata. Make sure the files in the metadata and the datastore are arranged in the same order. % Read the gender variable from the table. % Re-arrange gender to ensure information is linked to the correct files. Assign gender to the Labels property of the datastore. Use shuffle to randomize the order of the files in the datastore. Not all files in the dataset are annotated with gender and age information. Create a subset of the datastore that only contains files where gender information is available and age is greater than 19. Use countEachLabel to inspect the gender breakdown of the files. You will train the deep learning network on a subset of the files. Create a datastore subset containing 3000 male speakers and 3000 female speakers. Use shuffle again to randomize the order of the files in the datastore. Use countEachLabel to verify the gender breakdown of the training set. Read the contents of an audio file using read. Plot the audio signal and then listen to it using the sound command. The speech signal has silence segments that do not contain useful information pertaining to the gender of the speaker. This example removes silence using a simplified version of the thresholding approach described in . The steps of the silence removal algorithm are outlined below. First, compute two features over non-overlapping frames of the audio data: The signal energy and the spectral centroid. The spectral centroid is a measure of the "center of gravity" of a signal spectrum. Break the audio into 50-millisecond non-overlapping frames. Compute the energy and spectral centroid for each frame. Next, set thresholds for each feature. Regions where the feature values fall below or above their respective thresholds are disregarded. In this example, the energy threshold is set to half the mean energy and the spectral centroid threshold is set to 5000 Hz. Visualize the computed energy and spectral centroid over time. Extract the segments of speech from the audio. Assume speech is present for samples where energy is above its threshold and the spectral centroid is below its threshold. % Get the length of the all-silence or all-speech regions. % windows on each side. Finally, merge intersecting speech segments. Plot the original audio along with the detected speech segments. A speech signal is dynamic in nature and changes over time. It is assumed that speech signals are stationary on short time scales and their processing is often done in windows of 20-40 ms. For each speech segment, this example extracts audio features for 30 ms windows with 75% overlap. For each speech segment, the feature vectors are concatenated into sequences with 50% overlap. Each feature vector contains 50 features. Each sequence contains 40 feature vectors. Define the sequence parameters as a stuct. The figure provides an overview of the feature extraction used in this example. To speed up processing, extract feature sequences from the speech segments of all audio files in the datastore using tall arrays. Unlike in-memory arrays, tall arrays typically remain unevaluated until you request that the calculations be performed using the gather function. This deferred evaluation allows you to work quickly with large data sets. When you eventually request the output using gather, MATLAB® combines the queued calculations where possible and takes the minimum number of passes through the data. If you have Parallel Computing Toolbox™, you can use tall arrays in your local MATLAB® session, or on a local parallel pool. You can also run tall array calculations on a cluster if you have MATLAB® Parallel Server™ installed. Connected to the parallel pool (number of workers: 12). The display indicates that the number of rows (corresponding to the number of files in the datastore), M, is not yet known. M is a placeholder until the calculation completes. Extract the speech segments from the tall table. This action creates a new tall array variable to use in subsequent calculations. The function HelperSegmentSpeech performs the steps already highlighted in the Isolate Speech Segments section. The cellfun command applies HelperSegmentSpeech to the contents of each audio file in the datastore. Extract feature sequences from the speech segments. The function HelperGetFeatureSequences performs the steps already highlighted in the Audio Features section. In classification applications, it is good practice to normalize all features to have zero mean and unity standard deviation. Compute the mean and standard deviation for each coefficient, and use them to normalize the data. Create a cell array, features, containing the sequence predictors. Each entry in features is a D-by-S matrix, where D is the number of values per time step (the number of features), and S is the length of the sequence (in this example, 40). Create a cell array, gender, for the expected gender associated with each training sequence. LSTM networks can learn long-term dependencies between time steps of sequence data. This example uses the bidirectional LSTM layer bilstmLayer to look at the sequence in both forward and backward directions. Specify the input size to be sequences of size NumFeatures. Specify a hidden bidirectional LSTM layer with an output size of 100 and output a sequence. This command instructs the bidirectional LSTM layer to map the input time series into 100 features that are passed to the next layer. Then, specify a bidirectional LSTM layer with an output size of 100 and output the last element of the sequence. This command instructs the bidirectional LSTM layer to map its input into 100 features and then prepares the output for the fully connected layer. Finally, specify two classes by including a fully connected layer of size 2, followed by a softmax layer and a classification layer. Next, specify the training options for the classifier. Set MaxEpochs to 10 so that the network makes 10 passes through the training data. Set MiniBatchSize of 128 so that the network looks at 128 training signals at a time. Specify Plots as "training-progress" to generate plots that show the training progress as the number of iterations increases. Set Verbose to false to disable printing the table output that corresponds to the data shown in the plot. Specify Shuffle as "every-epoch" to shuffle the training sequence at the beginning of each epoch. Specify LearnRateSchedule to "piecewise" to decrease the learning rate by a specified factor (0.1) every time a certain number of epochs (5) has passed. This example uses the adaptive moment estimation (ADAM) solver. ADAM performs better with recurrent neural networks (RNNs) like LSTMs than the default stochastic gradient descent with momentum (SGDM) solver. Train the LSTM network with the specified training options and layer architecture using trainNetwork. Because the training set is large, the training process can take several minutes. The top subplot of the training-progress plot represents the training accuracy, which is the classification accuracy on each mini-batch. When training progresses successfully, this value typically increases towards 100%. The bottom subplot displays the training loss, which is the cross-entropy loss on each mini-batch. When training progresses successfully, this value typically decreases towards zero. If the training is not converging, the plots might oscillate between values without trending in a certain upward or downward direction. This oscillation means that the training accuracy is not improving and the training loss is not decreasing. This situation can occur at the start of training, or after some preliminary improvement in training accuracy. In many cases, changing the training options can help the network achieve convergence. Decreasing MiniBatchSize or decreasing InitialLearnRate might result in a longer training time, but it can help the network learn better. At the end of 10 epochs, the training accuracy exceeds 95%. Calculate the training accuracy, which represents the accuracy of the classifier on the signals on which it was trained. First, classify the training data. Plot the confusion matrix. Display the precision and recall for the two classes by using column and row summaries. 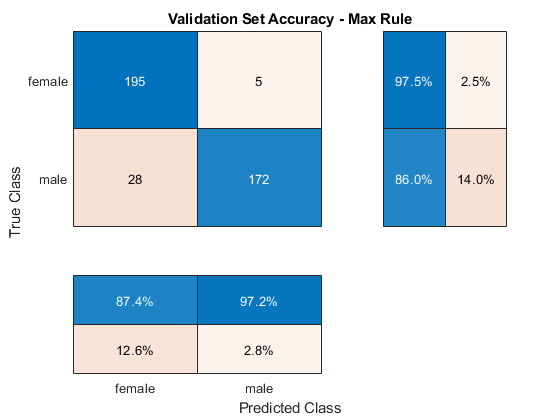 Visualize the confusion matrix on the majority-rule predictions. Measure the classifier's accuracy on testing data containing speech files that were not used when training the LSTM network. Use audioDatastore to create a datastore for the files in the cv-valid-test folder. Use the readtable function to read the metadata associated with these files. Read the gender and age variables from the metadata. Make sure the files in the metadata and the datastore are arranged in the same order. Create a datastore subset comprising only the files corresponding to adults where gender information is available. Remove silence and extract features from the test data. Use gather to evaulate FeatureSequences. Normalize the feature sequence by the mean and standard deviations computed during the training stage. Create a cell array containing the sequence predictors. Predict gender for each sequence. Introduction to Audio Analysis: A MATLAB Approach, Giannakopoulos and Pikrakis, Academic Press.